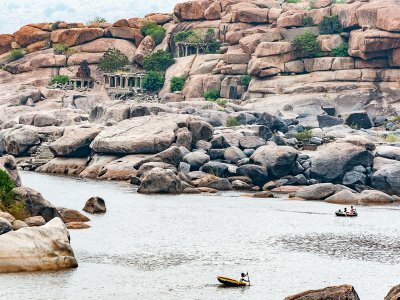 Travel to Hampi, the capital of one of the most glorious empires of India, the Vijayanagara empire, back in the sixteenth century. Hampi is supposed to be Kishkindha, the Vanara kingdom from Ramayana. Today, the temple town is a UNESCO World Heritage site. 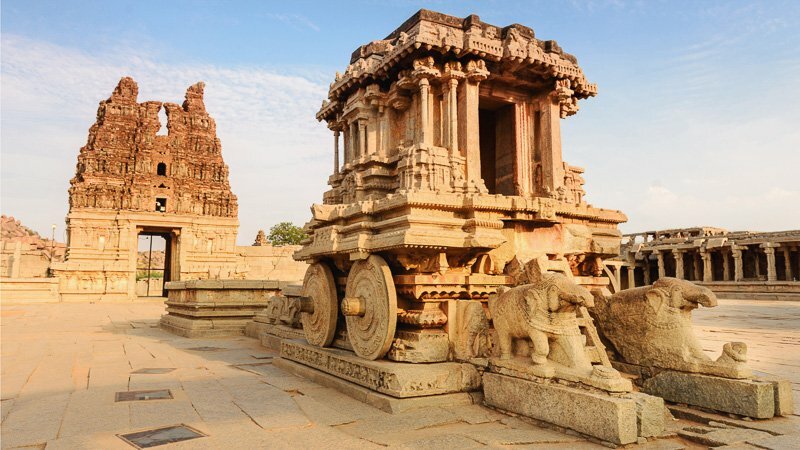 Hampi was witness to the glory days of the emperors of Vijayanagara, like Krishnadevaraya. It was also home to the witty Tenali Rama, who graced Krishnadevaraya’s court. 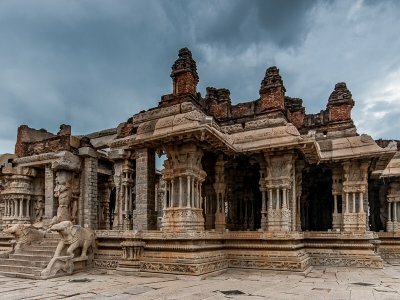 The town was renowned for its riches as well as the rich culture and played an important role in the history of Southern India for over two centuries. The place fell into despair after the fall of the Vijayanagara empire at the hands of Deccan sultanates in 1565. Today, Hampi is made up of the ruins from that glorious past. In terms of architecture, it is hard to top the splendor of rock-cut architecture of Hampi. This tour will be led by not one but two experts - Dr. Raghavendra Rao H. Kulkarni & Madhusudhanan Kalaichelvan. Dr. Kulkarni is a Professor of Art History, College of Fine Arts, Karnataka Chitrakala Parishath and a well-known expert of art history. He has to his credit multiple publications/books and research papers on related topics. Madhusudhanan Kalaichelvan, is one of the most well informed and scholarly subject matter experts. An architect, conservationist, painter, epigraphist, he has been conducting guided heritage tours through Road Access to Temples Heritage And Monuments (RATHAM). We leave Bengaluru early morning and take the highway going north. We will make a stop or two on the way for breakfast, restrooms, some coffee/tea, lunch and reach Hospet in the afternoon. 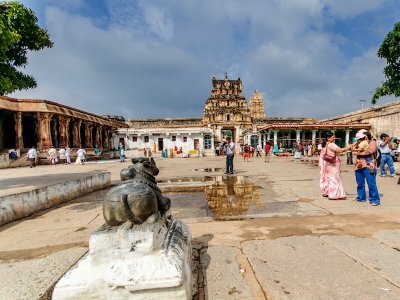 Hospet is the closest town/city to Hampi and will serve as the base for our trip. When we reach Hospet, we will first check-in to our hotel, freshen up and have a short rest after the long journey. Our experts, Dr Raghavendra Kulkarni & Madhusudhnan Kalaichelvan will then hold forth a talk and discussion to introduce the Vijayanagara empire, its glory, history & heritage. With this we hope to whet your appetite not just for the dinner that day but for the couple of days in Hampi that lie ahead of you. Meals for the day: Breakfast, Lunch and Dinner. Stay: Hospet. After an early breakfast, we leave for Hampi we will make the short trip from Hospet to Hampi and meet our local guide for Hampi. As we hear the many stories of Hampi from our expert and guide, we will visit the amazing sights that Hampi offers. Over the day, we will visit, among others, the magnificent statue of Ugra Narasimha, the Badavi Linga, the Krishna Temple & Bazaar, the two different statues of Lord Ganesha - Kadlekalu Ganesha & Sasivekalu Ganesha on Hemakuta hill, the splendid ‘living’ temple in Hampi - Virupaksha Temple, the Nandi at the base of Mathanga Hill, Mahanavami Dibba, Pushkarani (stepwell) and Aqueduct, Pattabhirama Temple and the Hampi Museum maintained by Archaeological Survey of India (ASI). We will return to the hotel in Hospet to retire for the day. After an early breakfast, we check-out from the hotel and leave for Hampi such that we are one of the first to enter the Vijaya Vittala temple complex before the crowds come in. We will need the time and space to enjoy the famous Stone Chariot, the musical pillars and dance halls of Vijaya Vittala. After Vijaya Vittala, we will go see the Kings Balance and then take a walk along the Tungabhadra river banks from Vijaya Vittala to Virupaksha Temple. This walk will give us a feel of the rocky terrain (Kishkindha of Ramayana). During the walk we will see the Purandaradasa Temple, Sugreeva Cave, Narasimha Temple opposite Sugreeva Cave (with stories of Ramayana). Those willing for a little adventure can jump over a few rocks on the bank to see the Kotilingam - 108 Shivalingas carved on a rock. At the end of the walk we will see the monolithic bull, Yeduru Basavanna opposite Virupaksha temple at the other end of Virupaksha Bazaar. We will also see the royal side of Hamp by visiting Zenana Enclosure, Lotus Mahal, Queen's Bath, Hazara Rama Temple, Elephant stables. We will also visit the recently discovered underground Shiva temple, Prasanna Virupaksha Temple. 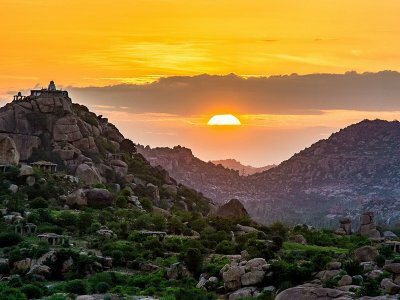 We will end our tour of Hampi by watching one of the sunsets that Hampi is so famous for. After dinner, we will start on our return journey to Bengaluru such that we reach Bengaluru early in the morning the next day. Meals for the day: Breakfast, Lunch and Dinner. After an overnight drive from Hampi, we will arrive bright and early in the morning in Bengaluru at the drop off point mentioned. The tour will involve enough walking outdoors in the day. Please ensure you carry your caps and sunglasses. Keep a bottle of water ready with you always to beat the heat. Given the walking we will be doing, ensure you get a good pair of walking shoes that you’re comfortable with, for the tour. We will be visiting many living temples. We should accordingly respect the traditions, beliefs of the people who worship here. Please ensure you have enough cash for miscellaneous expenses yu may incur. Do not depend on ATMs etc. locally to provide for this. Please note time of departures and be on time. If you’re not from the city where the tour begins from, if need be, please plan your travel accordingly.